Here is a selection of testimonies submitted to us via e-mail or Facebook, and originally published on our Hungarian-language website. These testimonies were selected and, unless stated otherwise, translated into English by Gwen Jones. To submit a story, please write to gwen.jones@gmail.com. My name is John Hajdu and I live in London, having escaped from Budapest after the Hungarian Revolution in November 1956. 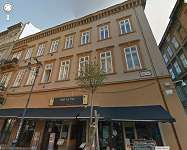 In June 1944 we were ordered to leave our home at 24 Hollan Erno utca and had to move in to a yellow star house. By coincidence my cousin and her family lived on the third floor at 4 Vaci ut, so we decided to go there at night, despite a strict curfew. There were armed anti-Jewish elements patrolling the streets, ready to shoot any Jews they came across. In normal circumstances this should have taken no more than 20 minutes but in fact it took much longer as we had to keep hiding in doorways along the way. We were soon joined by my aunt and uncle and his wife and my grandfather. By October all the men were rounded up and taken away. It was then the turn of the women. Each flat was searched and the women were herded together in the courtyard. However my aunt spoke to a non -Jewish family on the same floor and they agreed to hide us, which unquestionably saved my life). My mother with all the other women were taken away to Mauthausen. In fact I have written a book (My life in two countries) with much more detail, which is available on the web under my name, or by going into the Holocaust Memorial Day Trust website. The book is also available at the Holocaust Museum in Budapest. 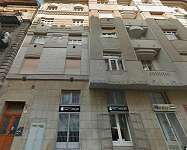 My home was suite 1 on the 4th floor from my birth in 1937 until leaving the country during the revolution in 1956. Six of us lived in that fairly large and bright apartment: my father, mother, grandmother and two aunts. My dad was called up for the forced labour service in 1940 (munkaszolgálat) and he died somewhere in the Ukraine in 1943....we only heard from the Red Cross that he was “missing”. Our building became a yellow star house in 1944, owing to the majority of residents being Jews, and we started wearing the yellow star. When deportations started, first my two aunts were taken, then a few weeks later my mother had to go. I was left in the care of my grandmother and in November were ordered to move into the ghetto.....we were crowded into a house in Klauzál utca. Soviet troops had given back our life and freedom in January 1945....grandmother and I went back to our home that was war damaged, but livable. 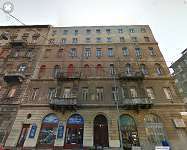 While we were in the ghetto, the apartment was lived in by fascist sympathizers who were given empty Jewish dwellings.....they escaped hastily, leaving blown windows, garbage and plugged up toilet behind, but otherwise most of our belongings intact. I left in 1956 and eventually arrived in Canada......one of my aunts followed me. My mom, her youngest sister and their mother had remained in the apartment until grandmother’s death in the 1960-es. At that time, the authorities deemed the apartment to be too large for just 2 people, and they were given the choice of either taking in tenants or exchanging their place for something smaller. They decided to move, and my mom and her sister had left the home that I knew. 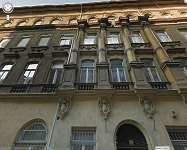 I have been visiting Budapest many times in the past 59 years and watched my old home regaining its pre-war elegance......it is a very nice and stylish building! My name is Claire Koffler, maiden name: Silber Klari. Born 1936 in the Jewish hospital in Budapest. 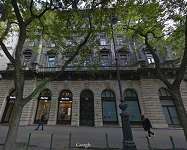 Lived in szekely bertalan utca 3 until the summer of 1944. 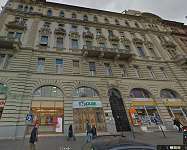 Moved to the csillagoshazba szekely bertalan utca 2B. We shared an apartment with other people on the second floor. My father was in a labor camp, from where he was deported to buchanwald. He came back in June, 1945. My mother was taken by the nyilasok to the obudai brick factory in November. Even after all these years, I do not know where did she died. 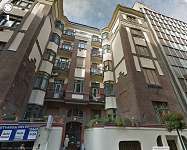 My uncle who had some connection took my brother and me to Dob utca 90 vedett haz, (Swedish house). Stayed there until the liberation. My brother, who would remember more details, died in 1996. In the workshop on the fifth floor (“Nádor Court” read the sign outside) there was a kindergarten until March-June 1944, run by my cousin Ágnes Somló. 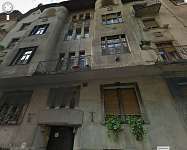 When it was designated as a yellow-star house, Ágnes and her mother, Mrs. Géza Somló, born Anna Strelisky, and Anna’s younger sister Irén Strelisky, (my father’s sisters), as well as the Strelisky family—József who was on forced labor service, my mother (born Valéria Landauer), and me, János Strelisky (I was 7 years old at the time), moved into the large workshop, which had skylight windows and a balcony. We lived here until we were removed from the house, following the Arrow Cross putsch. In a few apartments there remained some “Aryans” who’d been living there before. I only remember these two people: the pretty young girl Tessa Göndör, and our only neighbor on the 5th floor, Auntie Margit, with whose help we hid for 24 hours in the attic with my father, who had been allowed leave from forced labor service a few days earlier. I remember nights I spent reading in moonlight streaming through the skylights (as long as we weren’t being bombed), and that morning when the sidewalks were filled with “Imrédy is a Jew!” graffiti, the palisades erected in haste after Margit Bridge was blown up, and when they led us out with our small packages of belongings out to Szent István Park. And then they didn’t let us return. My aunts and cousin were deported to Ravensbrück (and killed), I ended up at the International Red Cross Children’s Home, while my mother escaped from the Óbuda brick factory back to Pest with a group led by people with “protection letters.” During the siege of Budapest, the skylights broke and the furniture was covered with snow. Our family lived at no. 40 Csáky (now Hegedűs Gyula) utca from 1938. In June 1944 the house became a yellow star one. Two families moved in our flat. One was my aunt with her small son and another family whose name I know: the Schneiders. My mother knew them as the two children attended the private day care service for children operating in our flat. The boy, Tomi, went to Palestine after the war. In case he is still alive in Israel he must be over 80. The girl, Márta, became a nurse then she attended university and taught Hungarian language and literature in a secondary school. After that she became the headmistress of a medical vocational school in Kalászi út in district 3 of Budapest. Unfortunately she died relatively young. We later moved to a protected house, from there to another one. Some people from no. 40 Csáky utca got to the ghetto. I was one and a half at that time and only know what my parents told me. At that time my name was Tamás Schneider. I was born in 1930. I lived at no. 63 Hegedűs Gyula (Csáky) utca, with my father, Pál (1895-), my mother, Rózsi (1897-) and my sister, Márta (1922-). My sister’s husband, István Révész had already been in forced labor service for a year by that time. We heard nothing of him, neither then nor after the war. He must have perished in the Don bend with thousands of other forced laborers and also Hungarian soldiers. At no. 40 Csáky utca lived a family we knew: the Kornfelds. I don’t remember their given names. They had two children, younger than me. The father was an electric engineer, in case I remember correctly he worked for Philips, and the mother operated a private day care service for children. I also attended that in the afternoons to do my homework and learn German. It was only natural that when we were forced to move in a yellow star house we moved in with this family we knew. They had a three-bedroom flat. We were allocated one room and another family moved in the third one. I have no idea who that family was with two or three young kids. You can imagine how crammed this flat was: there was only one bathroom with the toilet inside and also one kitchen. We did not have enough of anything: cooking utensils, cupboards, etc. People were impatient, envious and there were quarrels, most of the time without a real reason. There remained a few original tenants in this house who were not Jewish, and they continued living in their flats untroubled, however, you can imagine that the turmoil caused by the numerous new tenants could not have been pleasant for them, either. I only remember one of these people, not accidentally, more about it later. He was middle aged, a police officer, most of the time he wore civilian clothes, we rarely saw him wearing his uniform. He was well-mannered, did not express his views, always said hello, smiled at kids, and sometimes we chatted with him. I was 14 then and did not take our situation seriously, or did not really understand what was going on. There were some other boys in the house my age, we had fun, played together, went out of the house when we could, and when we didn’t manage to get home on time we turned our shirt inside out so that the yellow star could not be detected. We were proud of how brave we were. A flat part of the roof was covered with tin, and we were sitting there sometimes, sunbathing, reading, playing chess or dominoes, and when there was an air raid we also went up to watch the American bomber planes and the explosion of the anti aircraft bullets. We wished that some pieces of shrapnel would fall on top of the roof. We knew that what we did was very dangerous but we did not care. As I can now see the photo of the house with the bay windows it reminds me that we created “phones” of tin shoe polish boxes connected with a string and talked to each other through the windows from on floor to the one below or up. Sometime in September a few soldiers came and collected the men living in the house, even my age. We were marched to a large, fenced yard somewhere near Heroes’ square. We knew that there was no way back from there, only towards deportation. Somebody discovered a hole in the fence. We started creeping through. It was our turn when the soldiers realized what was going on. They shouted and fired shots in the air. I slipped through. Dad was behind me, however, he did not manage to get through as he was more corpulent than me so it was more difficult for him to move around and his clothes got stuck in the wire of the fence. The soldiers got almost there. Dad told me: “Run, hide in the bushes and go home in the dark”. I wanted to wait for him but he simply sent me away as he knew what was going to happen. I never saw him again. We were informed after the war that he died in Theresienstadt on May 4th 1945. In October Ferenc Szálasi became the ruler of Hungary. Members of the Arrow Cross Party were very happy as they had the opportunity to accomplish their plans against Jews. There were hardly any men in Budapest so they armed children aged 14-16 and these kids were raging, hunting for Jews and acted like big heroes against miserable people. On a nice day a gang of 4 or 5 boys entered our house. They were very loud and their uniform was way too large for them, which could have been funny in another situation. They said that that somebody sent radio signals to the British Air Force from this house and they were looking for the transmitter. My father was an officer in World War I., then was a reserve officer and kept his uniform at home. In that time there were accessories to the uniform: a belt, a shoulder strap and also a holster. He had not had a gun for a long time and he used to make jokes about keeping his sandwich in the holster. He was conscientious and as he was bound to keep his uniform he also took it with him to the Yellow Star House. The arrow cross kids searched all the wardrobes and cupboards in the flat looking for valuables and good quality clothes and found the uniform with the holster. That was all we needed. “You killed a Hungarian officer and hid the body. It is punishable by death!” And also: “Where’s the gun? Where’s the gun?” They shouted and cursed, the situation was horrible. We tried to explain but in vain. They forced us, the three families with children, down the stairs to the courtyard and made us stand in line next to the wall. “Where’s the gun? Where’s the gun?” They pointed there sub-machine guns at us. We already saw our fate. Our neighbor, the police officer, arrived just then. Luckily he was wearing his uniform that day. He asked people what was happening. The brave arrow cross kids told him in a loud voice that they managed to find the murderers of an army officer. My mother told him the truth quietly. The neighbor understood the situation at once and drove the kids away with a few slaps in their face. They shouted that they would return but they did not. Had not that kind man arrived exactly in the right time there would be nobody to tell you this story now. Luck? Fate? Divine intervention? Think what you wish, what you believe in. I am sure that in those horrible times there were lots of occasions when the fate of people only hung by a thread. My sister, Márta, was also taken to forced labor service in October. She was in Transdanubia, in Dinnyéspuszta with around a hundred young women digging bunkers against the advancing Red Army, led by the German Todt organization. Márta was a chartered scrub nurse and set up a simple clinic there for girls and soldiers. This is how she was able to arrange for a waybill for Mum as if she had belonged there and only been on leave. We got there in mid November. We were digging those ridiculous bunkers for about a month, then the Germans retreated and two or three Hungarian soldiers escorted us back to Budapest on foot. We arrived one day before the Russian siege. We got to the ghetto and starved at no. 7 Klauzál tér until the liberation of Budapest. Then we went straight back to our flat at no. 63 Csáky utca, where we found a family that had been bombed out of their flat. We had to share our flat with them: we occupied two rooms and they lived in the other two. I do not have to detail what this forced living together was like. I do not know what happened at no. 40 Csáky utca since we left it. I also do not know or cannot remember what happened to the Kornfelds. In 1949 I emigrated to Israel, my name is Itzhak Shelah. My sister remarried and when her husband died my mother moved in with her. A few years ago when I was visiting Budapest I had a look at the names of people living in the house. That bombed-out family still live there – must be the second or third generation. I think this is typical of the fate of Hungarian Jews. It is true that the flat was rented, not our property, however, the old, quality furniture, tableware and all kinds of household equipment remained theirs. In the spring of 1944 I had just turned six years old. I can distinctly remember the day of March 19. For example, it's not from history books that I know this date, but I remember it constantly. My parents tried to explain something about what happened on that day. I didn't truly understand but, from the general atmosphere of that day, and the adults' behavior, I know that there was something very wrong. And then, suddenly, school came to an end. At the "field," the large, grassy part of the still partly-built Buda street, our playing together came to an end. Kindergarten-age children told one another who they could and could not play with. I don't remember precisely when we had to leave our apartment in Buda (12th district, Nárcisz Street 9). Maybe it was at the end of April when we moved into the yellow-star house at Damjanich Street 33. There was five of us: me, my father, mother, 18-month-old sister and my grandmother who had been bombed out of Rákosszentmihály, and been widowed by the blast. The windows of our apartment with a kitchen and living room looked onto the interior corridor of the house. I slept by myself in the kitchen, and the others in the living room. I had almost forgotten the anxiety of March 19, and the hostile behavior of some of the Nárcisz Street children. I made plenty of new friends in the house. I didn't need to be afraid of them, they didn't mock me, I didn't have to protect myself, or feel guilty or ashamed with them as the older ones among them, like me, also wore the yellow star. All of them wore wooden-soled sandals which made a deafening cracking sound as they ran along the corridor's stone floors. Instead of the field in Buda, I now had the Városliget city part. We went here every day for some fresh air with my mother and younger sister, in her pram. There were swings, a sandpit, and a park-keeper too, who kept things in order. So much so, that once, when it was very warm, he warned my mother to put my cardigan back on me, because it had the yellow star sewn onto it. Naturally, she did so and this never happened again. I don't know what my mother was thinking when that happenend. I remember well that I had done something bad again, I had to feel bad for some reason, and there was no doubt that once again, we had to follow the park-keeper's instructions. One evening, my mother sat on the edge of my bed in the kitchen. She said: tomorrow we'll be parted. Dad and Grandmother are going somewhere. I started crying bitterly. I wept that I'd never see them again. My grandmother went to her older sister's apartment on Dohány Street, which was also in a yellow-star house. She found the apartment empty, and it turned out later that the older sister and her family had been taken to the Óbuda brick factory. The soles of my uncle's feet were beaten so badly that he could never stand properly again, but they survived. Returning home, they found my grandmother alone and dead in the apartment. Had she been ill? Had she starved to death? We never learned the details. As the former first secretary of a social democrat (Transport Workers) trade union, my father was well known in transport workers' circles. This is why he thought it necessary for him to separate from us. He slept at a different acquaintance's every night, and during the day, he hid somewhere in the city. One night, the air-raid supervisor at his friend's house forcefully ordered him down to the shelter during an air raid. There he met a postman he knew. The postman said: this man is a Jew. Don't let him leave until I find the patrol! And he brought the patrol! We cannot know who was thinking what in the basement shelters of large Pest apartment blocks. Yet nobody told him to run as fast as he could. It's not certain that everyone agreed with the events, but nobody could have known what consequences there would have been for letting him run. The word was that the postman was killed by a stray bullet in the last days of the war. What is certain is that the last person who saw my father in Budapest was the nurse Erzsébet Németh who was working on the railways. Every day she went to the railway station and tried to make contact with people already on the wagons. It was she who brought my father's last farewell letter to us. The most important message of the letter was: if you remain alive, whether Hitler or Stalin wins, you must leave this country! A few acquaintances of his who returned from Auschwitz had seen him there. And then all traces of him are lost. She asked whether it was really me. She suggested that I go with her to Csepel to visit her 90-year-old father's apartment, because he would like to give me something that he had been safeguarding for 50 years. And so we went! The former social democrat railway man, who was still in good mental and physical health, told me that my father had spent his last night in Budapest, and given him two last documents, because if he was caught, they should find nothing on him. He gave me my father's military ID papers, and my ID photograph taken together with my 18-month-old sister. These are enlarged and framed on the wall of my sister's apartment. 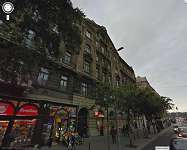 We lived in Király Street 17, on the corner with Holló Street. The last apartment at the end of the corridor on the second floor was ours. The nameplate read "Mrs. Izsák Hubert, widow," this was my grandmother. My grandfather had been a carpenter, like the Nazarene, and died long before, probably in Nyíregyháza, because that's where the family was from. There were four boys, and my mother. All of them were artisan or trade assistants. My mother was a gentlemen's tailor's assistant. In the 30s, the oldest boy left for Palestine with the Zionists, the youngest was taken on some forced labor service and never came back, and the other two boys were taken away on forced labor service, but they returned. My mother and I hid with false papers in Kunszentmiklós, that's how we survived. My grandmother ended up in the ghetto and survived. The house had a large front entrance, big enough for a horse-drawn cart, and a small gate. The gate had two stone stops on the street side, and they're still there today. Inside there's the usual courtyard, with cobblestones and a carpet-beating rack. Opposite the gate was the concierge's apartment. He was an Arrow Cross supporter, but was probably only following the trend, since he mostly (or completely) treated the Jewish residents the same as before - he was firm, because there needed to be order, but fair. He also let me out after the curfew, when my mother came to look for me to rescue me. My father received the call to go to the Tattersaal, and his comrades organized false papers for him and for me too. We travelled as Christian refugees to Kunszentmiklós, where our reception had already been organized (by Dr. Magda Jóboru). I started elementary school there, illegally. That was the fall of 1944. I didn't know the residents on the rest of the corridor (perhaps they were non-Jews), and in the largest apartment after the stairwell was Klopfer, the artificial flower seller, who had his apartment and workshop there. This is memorable because the Klopfer family made the yellow stars for the whole house out of beautiful, golden-yellow velvet, usually used to make lily stamens. Ours were the most beautiful stars on the whole street! Underneath the Klopfer family, in a large first-floor apartment with a balcony, lived a secretive landlord we never saw. We went on tiptoes in front of his door. Round the back there was a "maids' staircase," and that's what we were supposed to use, but since we were tenants, we had the right to use the main staircase too. In the courtyard on the right was the entrance to the basement. When they struck the metal on the carpet rack, we hurried down into the shelter. It was a dark, musty-smelling little place, every family had their own corner, and we sat and suffered there on conveniences, usually suitcases in which we brought our most important belongings. The concierge was the air-raid warden. Once he took us down into a small opening and explained that if the house collapses on us, we should break the wall here and get through to the basement of the house next door. In the apartment there was a smoothed, strip-jointed floor, shutters on the windows, and no heating. Only the kitchen range gave any form of heat. It was a wood- and coal-fired range, like the brass boiler in the bathroom. Next to the gate on the street there was a small display case used by the Klopfer family. It was the only textile shop from our gate to Holló Street. Our 3 windows were on the Holló Street side, the last 3 windows on the second floor. I have been living at Andrássy Road 21 for twelve years. The house was unveiled in 1888, and designed by Vilmos Freund. Unfortunately, it is in a poor state today, but it still an imposing building even in its ruins; when people see it, they gasp: how beautiful it must have once been! And it truly must have been beautiful, every high-ceilinged middle-class apartment already contained an interior bathroom, and with a few exceptions, all the windows look onto the street, the lift shaft, the few remaining stairwell decorations and the bannister are wrought ironwork. When I learned that the house had been a yellow-star house, I decided to find out as much as possible about the old residents, who they were, and whether they survived the Holocaust. The oldest remaining tenants in the house moved in here in 1950 and so sadly I couldn’t learn anything from them, so I took my research in another direction. Here I’d like to thank the Budapest Metropolitan Archives, the Jewish Archives, and the employees in the ceremonial department of the Hungarian Jewish Congregation, who helped advance my work, and am continually grateful to those descendants whom I succeeded in finding, and who helped me, a complete stranger, from the first word onwards, and involved the lives of their own families. I was very luck to find in the archives the 1941 census-taker’s sheet, which I compared with the one from 1945, the sheet assessing war damages, and I also examined the lists of voters from 1935 onwards. On the basis of these I established that the majority of all the businesses and tenants in the house were Jewish, and only a few apartments contained non-Jews. I didn’t come across any trace of which ghetto house they had to move into, but I was pleased to see that many of them did survive the war, and moved back into the house afterwards, and in fact took in other survivors too. What is certain is that three people did fall victim to the Holocaust, and I wasn’t able to find definite information about a few people. I have highlighted their names and other data in the table in the hope that maybe someone who reads it will know something about them, and so I can supplement my research. My family had lived there since 1935. My father was a solider on forced labor service. He ended up in Dachau. Since he was a butcher, he worked in the kitchen and escaped. He then ended up in Auschwitz where he died. My mother spent 4 months in the Markó Street prison. My father had spent 6 months in the penitentiary. We were Jews. I lived with my grandmother and sister on Dob Street, in apartment no. 6 on the ground floor. My sister was sent on forced labor service, and dug trenches around Pest. Afterwards she ended up in the ghetto, where she was a nurse. I lived with my grandma in the yellow-star house. Another family also moved into our small, one-bedroom place. There were lots of fights over the WC and bathroom. I often received a slap or a kick when I was taken on house cleaning duty. My grandfather, three aunts and cousins all died in Auschwitz. During the air raids, we lived in darkness in the basement. Was the concierge a decent man? My mother gave him her fur coat to look after, but when my sister asked for it back, he said it wasn't him who’d received it. I got a bicycle for my bar mitzvah in 1943, which I had to hand over to the authorities in 1944. I went out to get food without the yellow star. In the ghetto, ten of us lived in one room. I helped the Ghetto organization, I took medicines, sometimes empty kettles, and sometimes corpses. My grandmother, sister and I escaped, having lost weight, but spiritually, as fighters. After the war, my sister and her son lived in the apartment. I attended the Pest Jewish high school for 4 years. I wasn't accepted at the Technical University, because my father owned a kosher butcher's shop, where my mother, and later my sister worked the till. I worked for one year, and then got into university. I became a mechanical engineer and after 1956, I lived in Australia and the USA. Nazism had taken away my youth and my family. I missed my mother very much. I can only say: "Never again." My life history has been long and full of adventure, but the first 15 years left a deep impression on me. I visited our former apartment when I was in Pest the last time. We lived at Dob Street 106, apartment no. 9 on the ground floor.